next up on the giveaway party roster is megan from c'est la vie paperie! her shop is open again after a short hiatus! woohoo! she makes wonderful stationery in fun, whimsical colors. she's so sweet to offer the winner of this giveaway a set of monogrammed cards in this unique design! cute, right? i love personalized stationery. the winner will receive 10 cards with 10 envelopes. perfect! 1. head on over to c'est la vie paperie & leave a comment with your favorite item from the shop. And I think her business cards are so cute. Very creative. I love her thank you cards! Too cute! i like her retro circle stationary! Thank you floral is just adorable. especially for shower thank yous. i LOVE the retro circles! i love the thank you cards cause it seems like i'm always buying them ever since i had a babe. i love the one that says "hey" cause i love that font! 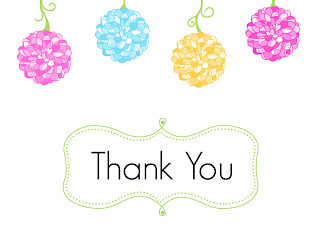 I like the Thank You floral cards - cute! custom designed business cards - what fun! The thank you floral cards are awesome!! Hooray for Boulder ladies! love the hey note card. I like the "Hello" stationary! I love her Thank you floral cards. I want the Floral Thank You Cards (the ones you pictured here! )...they are so colorful! i love the thank you floral cards, soo cute! Oh I must have those business cards. They would be perfect! 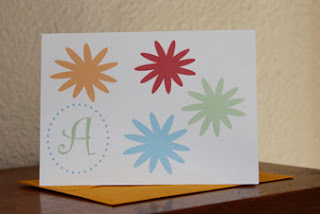 I love the monogrammed Floral Burst cards. Hey notecards are adorable. I know a few friends I could send those to! the retro circle notecards are pretty stinkin' cute. love the thank you floral!! Okay. That "Hello" set is adorable! the thank you floral cards are so cute! The link doesn't work to her website, but I do love the "thank you" cards on this post, adorable! i tweeted for this giveaway! Like the floral thank yous! I love all of the personalized sets!! i love the business cards! cute. I like the Thank You Floral cards! The monogrammed floral burst is my fave! Adore the "hey" note cards! so cute!